Wide doorways, plenty of room to turn a wheelchair, comfortable kitchen/living room with freeview T.V. and a split level hob/oven. The Bathroom has a walk in shower/wet room. 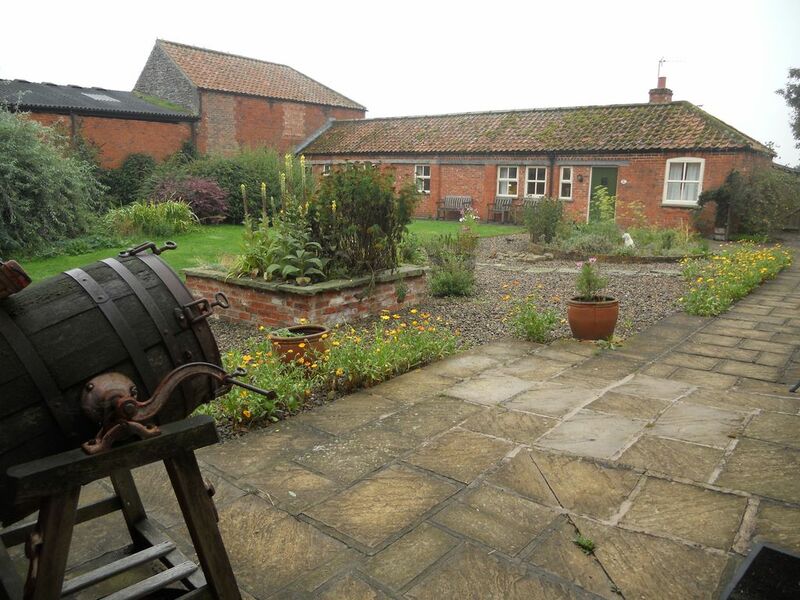 Dove Court is three cottages set within the farm, with it's own Courtyard. Each cottage is a separate unit, but can be booked together for group/family holidays, with a discount. Bedding towels and heating are included. Swallow Cottage has a wet room with a wheel in shower making it particularly useful for those with mobility problems. Although all cottages are designed to be accessible to everybody, we have ensured that they are also homely rather than "hospitally". Sparrow Hall is a mixed farm, and I run it with the help of friends and my daughter, since my husband died two years ago. I am passionately interested in sheep and cows, and all the wildlife around the farm which at the moment includes nesting barn owls and their chicks! Visitors can engage as much or as little as they want with the farm: all are welcome to enjoy the delights and downfalls of Sparrow Hall Farm! Notes on accommodation: The cottages were all designed and converted from shire horse stables twelve years ago. The original wide doorways made them particularly suitable for conversion to wheel chair friendly accommodation. Outside: Covered Barbecue area and a landscaped grass and pond provides a relaxing place to meet. There is a Laundry with washing machine Tumble Dryer and a chest freezer which is shared by the three cottages. The River Dove meanders through the farm and has a wealth of Wildlife. There are Rainbow and Brown Trout and Grayling which you may fish for if you wish! This is a working farm, and we may be involved in hay making or Harvest but will always have time to chat and show you around. Good value cottage, especially on Bank Holiday. If you want luxury this isn't for you - if you want a charming place to stay, with friendly owners and to be among animals - farm, domesticated and nature, then this is for you. Heating and shower work really well - the furnishings are old but comfortable. The courtyard is lovely to sit out in during a sunny day. Just ask the owners about internet if it is important to you - it is limited. Over all, thoroughly enjoyed our stay and would go again. Stand alone working farm which feels like in the middle of nowhere but with so many places nearby to view. Easy travelling to Pickering, Malton, Dalby Forrest, Scarborough on one side and York, Harrogate, Emsley, Thirsk on the other. Enclosed courtyard was great for the well behaved dogs to roam. Absolute silence on a night sat in the courtyard, no flight paths, no passing traffic...'Silence was Golden'. Only criticism I have would be that the cottages could do with updating and courtyard could be tidied up a little but we enjoyed our stay tremendously with all the ventures we had and using the cottage as a base.